The lowest calorie ready-to-drink GMP based medical food for PKU! 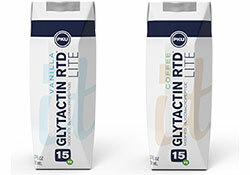 Glytactin RTD LITE is the lowest calorie, lowest Phe GMP based ready-to-drink medical food for the dietary management of PKU. With only 120 calories per serving and only 15mg Phe per 15 grams protein equivalent. Comes in two delicious flavors, Coffee Mocha and Vanilla. Who may benefit from Glytactin RTD Lite?